Vegetable puffs,another popular snack from the bakeries in Kerala and a delicious one too.This is such a tempting filling snack especially when the outside temperatures are very low,I just love to bite into these and sip a cup of hot tea.Though I make these often,but never clicked pictures until I prepared the vegetable puffs sometime back for a potluck.All liked it very much and so here is the flaky puffs recipe that can be put together for tea or as an appetizer.Enjoy !! Thaw the puff pastry sheets as per packet instructions. Prepare the filling- Boil the potatoes with salt and cut small cubes,keep aside.Heat oil in a pan and saute onion till golden brown,add in the ginger garlic paste.Saute till raw smell disappears.Add in the spice powders.Add in the thinly sliced beans,carrots.Toss well,add salt and cook covered until 5-6 mins on medium flame.Uncover lid,add in the frozen peas.Mix well,adjust salt.Cook till the veggies are tender and oil separates.Add in the cubed cooked potatoes,mix well.Put off flame & let it cool. Preheat oven to 400 degrees F and line a tray with parchment paper. Cut the thawed sheet in 9 pieces or 6 pieces (rectangular /square) depending on your preference.Fill each piece with filling and seal the edges with water and using a fork press down the sides so that a nice crimp appears and the sides are sealed good.Place on a tray lined with parchment paper. Repeat till you finish all the sheets,Brush the top with egg wash and refrigerate for 15 mins covered with cling wrap before popping in the oven. Remove cling wrap and place in the oven and bake for 15 minutes.Remove from oven and let it cool on sheet for 10 minutes.Serve warm with ketchup !! * Popping the prepared puffs back in the refrigerator helps the butter in the puff pastry sheets to solidify and so puffs up very good once put in the oven. 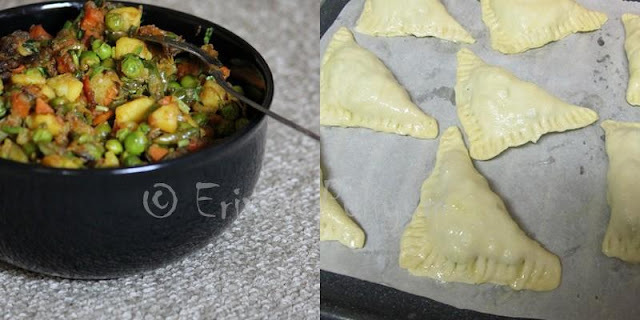 * You can also check out how to make puff pastry sheets at home. 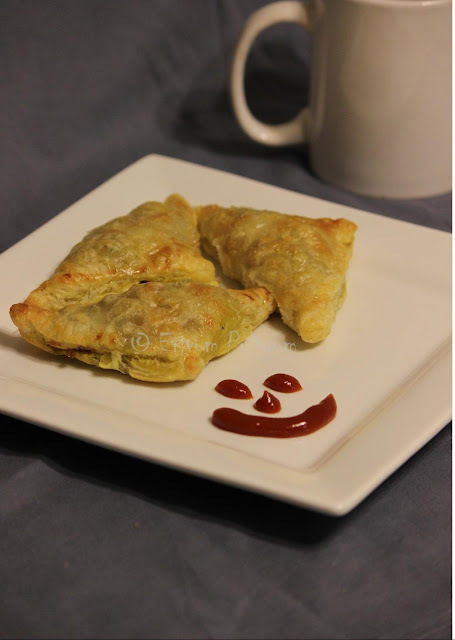 nice clicks julie.. one of my fav evening snack..
A great alternative to samosas :) I tried to make curry puffs the other day and they were okay but tried to make my own vegan puff pastry and it wasn't as puffy as it should've been. Yours look just right! am so loving it esp with that mug! !Perfect snack. very temptin and delicious looking pastries. perfect finger food. Lovely & yummy puffs. Puffs are a great snack in the evening with a cup of tea, very filling in fact! Loved the recipe & also those endearing pics! Tempting and wonderfully presented veg puffs. 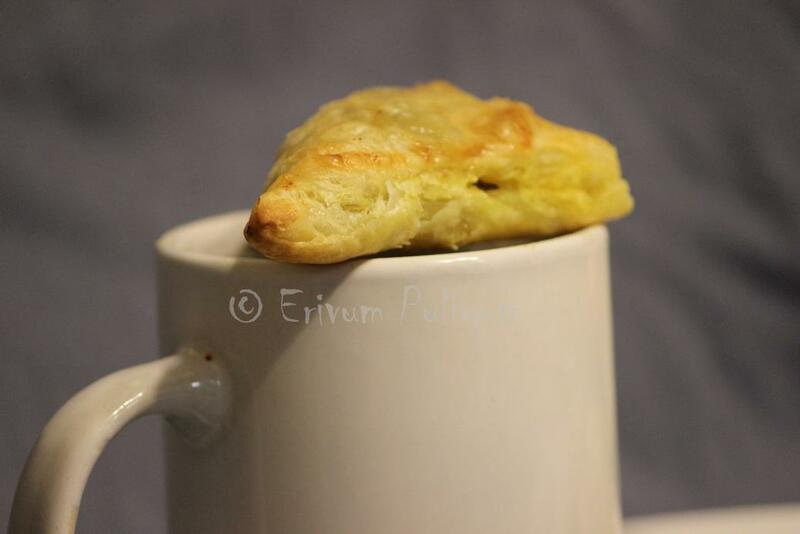 Pass me both, the tea and the puff, please..
Mmmm... veg puffs... bring it on anytime! Looks good. Love veggie puff from my local bakery. I can die for, this my most favourite snacks,just love it. Puffs look very perfect and delicious. Thanks for the tips on putting them in fridge before baking. Delicious looking puffs! Forgot to add this along with the comment. All time fav of all. Super love the way you have presented. Absolutely a yummy treat dear..
very nice Julie, the pastry looks flaky and I love the filling! looks delicious, loved your version. delicious snack to serve especially when you have company for tea.